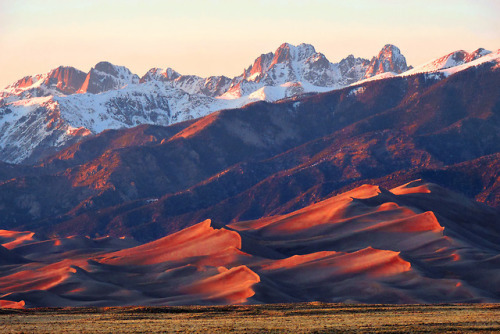 As the sun nears the horizon of this huge, high-elevation valley… – Sig Nordal, Jr.
March 31, 2018 March 31, 2018 Sig Nordal, Jr.
As the sun nears the horizon of this huge, high-elevation valley at Great Sand Dunes National Park and Preserve, its intense light shines through soft atmospheric haze – shifting the color spectrum toward crimson. Early explorers were moved by this phenomenon and named this Colorado mountain range Sangre de Cristo, meaning the “Blood of Christ.” Visitors today are also inspired by the vibrant color and light in these mountains, which reach over 14,000 feet! Photo by Patrick Myers, National Park Service.